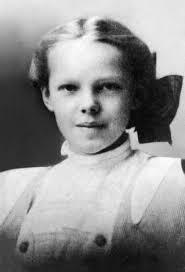 Amelia Mary Earhart is born in Atchison, Kansas, to parents Amy Otis and Edwin Stanton Earhart. She has a sister, Muriel, who is born two years later. Amelia lives primarily with her maternal grandparents in Atchison during her school years and spends summers with her parents in Kansas City. Despite her grandmother’s disapproval, Amelia spends her free time roaming the outdoors, riding imaginary horses, sledding, climbing trees and hunting. Amelia rejoins her parents in Des Moines, Iowa, where she sees an airplane for the first time at the Iowa State Fair and later recalls being unimpressed as it was a thing of rusty wire with wood and looked not at all interesting. Until a decade later at a stunt-flying exhibition, that Amelia's passion for flight is awakened. These are unstable, difficult years for Amelia and her family; as Amelia's grandmother who raised her, dies in 1911 and her father struggles with alcoholism, losing his job and checking into a sanatorium for about a month to rehabilitate. The family moves to St. Paul, Minnesota in 1913. This is the period when Edwin is again unable to recover and find a job; Amy leaves him and moves with Amelia and Muriel to Chicago. Amelia graduates from Hyde Park High School in Chicago; she excels in science from Hyde Park only after determining that it had the best science program in that area. But, Amelia had trouble making friends — her yearbook caption reads, “A.E. — the girl in brown who walks alone"
This is the period when Amelia attends the Ogontz School, to finish an exclusive finishing school outside of Philadelphia. For being exceptionally good in her studies Amelia becomes Vice President of her class. She does not graduate; instead, she chooses to be a volunteer at Toronto's Spadina Military Hospital as a nurse for wounded World War I soldiers. While being in Toronto, she attends a flying exposition with a friend. A stunt pilot dives at Amelia and her friend — “I am sure he said to himself, “watch me make them scamper,"“ Amelia later recalled — but Amelia stands her ground. She points to this incident as a personal beginning — “I did not understand it at that time, but I believe that little red airplane said something to me as it swished by." 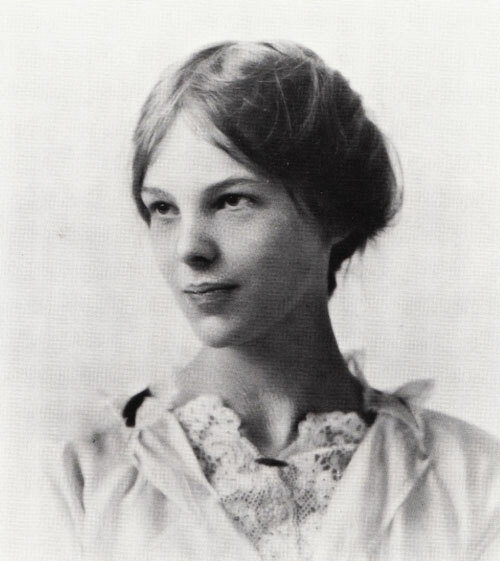 Amelia only attended Columbia University for one semester in 1920, on a pre-med program before leaving for Los Angeles to be with her parents; who have reunited. She-became hooked on flying soon after dropping out of school and in May of1932. Amelia attends an air show in Long Beach with her father; along with pilot Frank Hawk, she takes her first ride in an airplane. “By the time I had got two or three hundred feet off the ground, I knew I had to fly,” she later recalled. Amelia has her first flying lesson with pilot Neta Snook. She worked for a variety of jobs —truck driver, photographer, and stenographer for save money to take these lessons, and soon after six months later she is able to purchase her first airplane, a yellow Kinner Airster biplane she names the Canary. December 15, 1921 is considered a good year for Amelia; as she passes her flying license tests given by the National Aeronautic Association; and flies in the Pacific Coast Ladies' Derby in Pasadena two days later that. Amelia sets an unofficial altitude record for female pilots after flying the Canary to 14,000 feet. Amelia began participating in public aerial demonstrations and air rodeos. In the fall of 1922, she sets an unofficial altitude record for female pilots after flying the Canary to 14,000 feet. 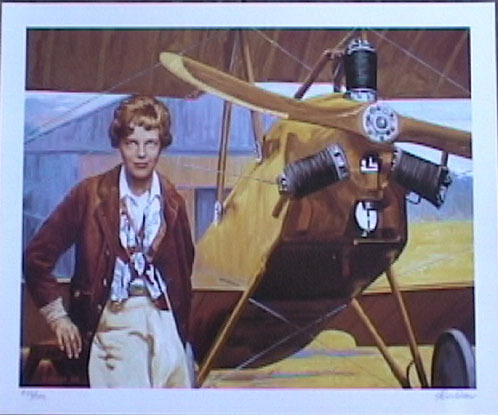 On March 17, 1923, Earhart received top billing for the air rodeo and opening event at Glendale Airport in Glendale, California. Amelia is issued an international pilot's license by the Federation Aeronautique Internationale (FAI ), and became the 16th woman ever to achieve this. After Amelia's parent’s divorce, she drives with her mother to Massachusetts from California along with her sister Muriel. Amelia moves to New York for a short time to reenroll at Columbia, but she soon moves back to Boston where she first starts working as a teacher and then as a social worker at Denison House, teaching English to Syrian and Chinese immigrants. In 1927, Amelia joins the Boston chapter of the National Aeronautic Association, and is occasionally featured in newspapers as an advocate for female pilots and aviation. Amelia Earhart, pilot Wilmer Stultz, and co-pilot and mechanic Louis Gordon depart from Newfoundland in the Friendship, a tri-motor seaplane, they arrived in Wales after 20 hours later and greeted by cheering crowds. Amelia published a book about the Friendship flight, 20 Hrs. 40 Min. Amelia teams up with publicist George Putnam to write this book and he quickly promotes her to celebrity status. 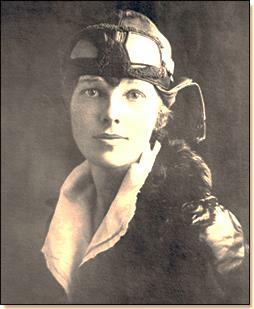 Amelia goes on a national book tour, where she endorses on products like Lucky Strike cigarettes and Modernaire Earhart Luggage and becomes known as “Lady Lindy” because of her similarity to Charles Lindbergh. She also becomes Aviation Editor for Cosmopolitan magazine. Amelia took the initiative to buy another airplane, a single-engine Lockheed Vega. In the Vega, where she participates in the Women's Air Derby race from Santa Monica to Cleveland, coming in third place. Amelia helps found The Ninety-Nines, Inc., the first organization for women aviators; she became its first president in 1931 and holds that position for two years, during which time she also uses her personality status to endorse the growth of American commercial airlines. Amelia sets the world women's flying speed record of 181.18 miles per hour. Between 1930 and 1935, Amelia will set seven women's speed and distance records. 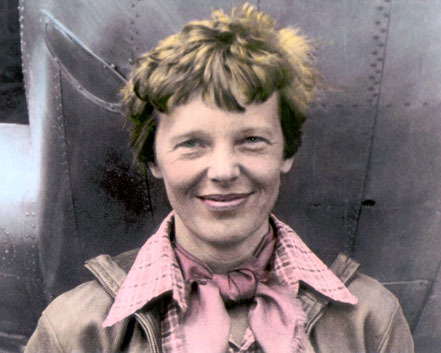 Amelia Earhart marries George Palmer Putnam; Wary of the institution of marriage, Amelia refused George's proposals more than six times before she agrees. She will emphasize that her marriage is a “partnership” with “dual control." Amelia writes her second book, The Fun of It. 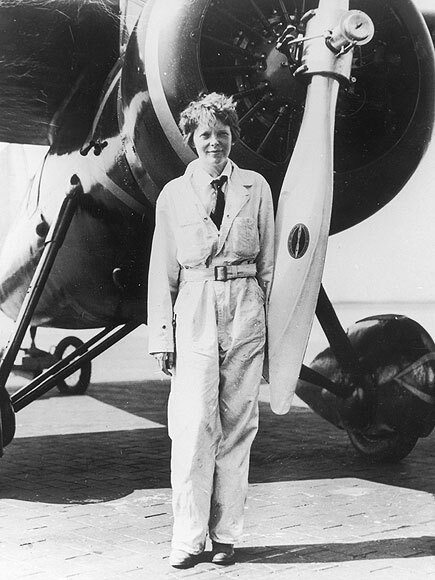 Amelia Earhart becomes the first solo woman to fly across the Atlantic Ocean. She departs from Newfoundland and lands in a pasture in Northern Ireland. This act earns her the Distinguished Flying Cross from Congress, the Cross of Knight of the Legion of Honor from the French government, and the Gold Medal of the National Geographic Society from President Hoover, for becoming the first woman to ever receive this prestigious award. The site of her landing in Ireland now has a small museum, the Amelia Earhart Centre. 1933, Amelia visits the White House; from this visit she develops a friendship with First Lady Eleanor Roosevelt. Amelia flies across North America for the second time, breaking her own record with a faster flight time. Amelia receives the Harmon Trophy for America's Outstanding Airwoman for the third year in a row. Amelia is the first person to fly solo from Honolulu, Hawaii to Oakland, California. This is the year she also fly solo from Los Angeles to Mexico City (April 19-20) and later from Mexico City to New York (May 8). In between flights she works as a career counselor to women at Purdue University. Purdue University finances a new plane for Amelia, a Lockhead Electra 10E which she calls the “Flying Laboratory,” though the plane was purchase less for scientific research and more for Amelia's new dream: a “prize - one flight which I most wanted to attempt - a circumnavigation of the globe as near its waistline as could be." Amelia and her husband George Putnam plan for her world flight, raising money and consulting with advisers, mechanics, and navigators. Amelia and her navigator, Fred Noonan, along with Captain Harry Manning and stunt pilot Paul Mantz, fly the first leg of the trip from Oakland, California to Honolulu, Hawaii in 15 hours and 47 minutes. When they try to continue from Honolulu three days later, the plane ground-loops during take-off and they have to call off the flight. Amelia departs on a second attempt, at the time of departing from Miami, Florida with the plan of traveling from west to east. Fred Noonan is her only crew member on this second flight. They complete nearly 22,000 miles of the flight, stopping in South America, Africa, India, and Lae, New Guinea. Amelia Earhart and Fred Noonan depart from Lae; and their destination is Howland Island, a tiny island in the Pacific only 13,200 feet long and 2,650 feet wide. Amelia and Noonan cannot find the island, and they lose radio contact with the Coast Guard cutter Itasca, who can hear that they are lost but cannot return communication. This is the year when they disappear over the Pacific Ocean; and president Roosevelt issues a massive search for Amelia and Noonan, and George Putnam finances his own search until October 1937, but their efforts are unsuccessful. 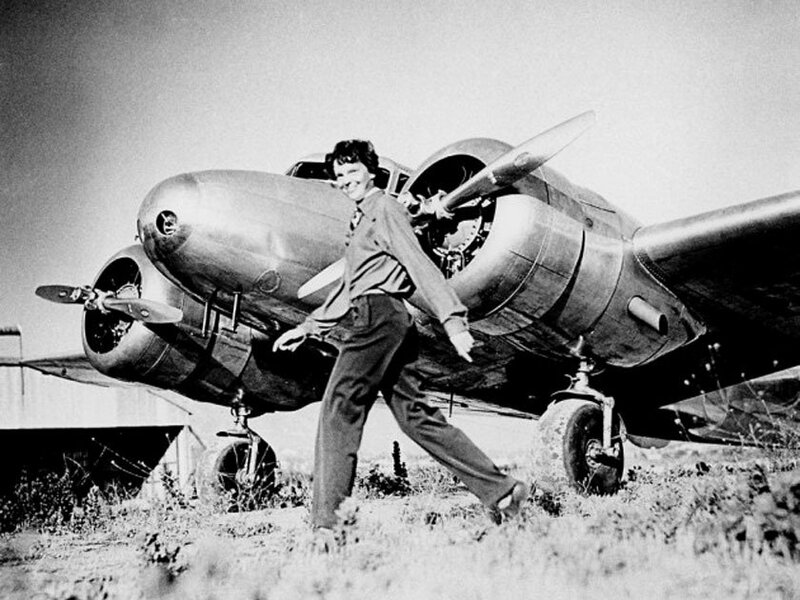 In 1939 Jan 5th Amelia Earhart is declared legally dead in a Los Angeles court.